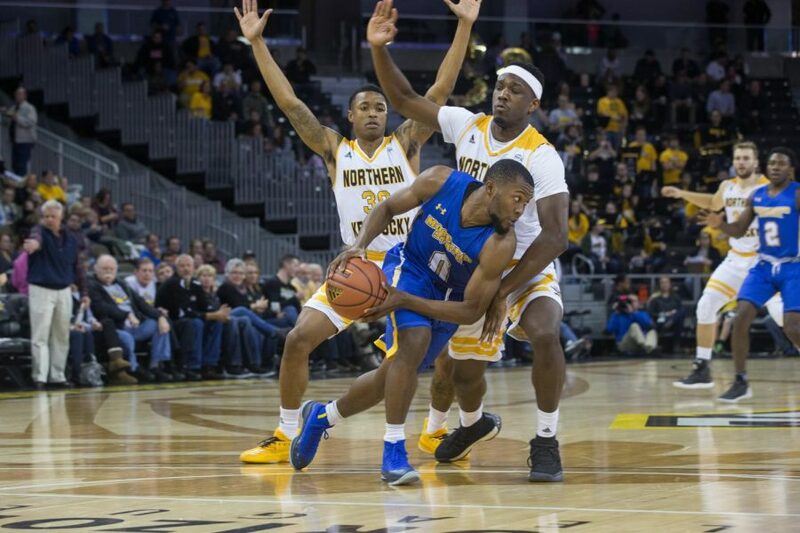 NKU players guard a Morehead State player. The Norse won 86-49. 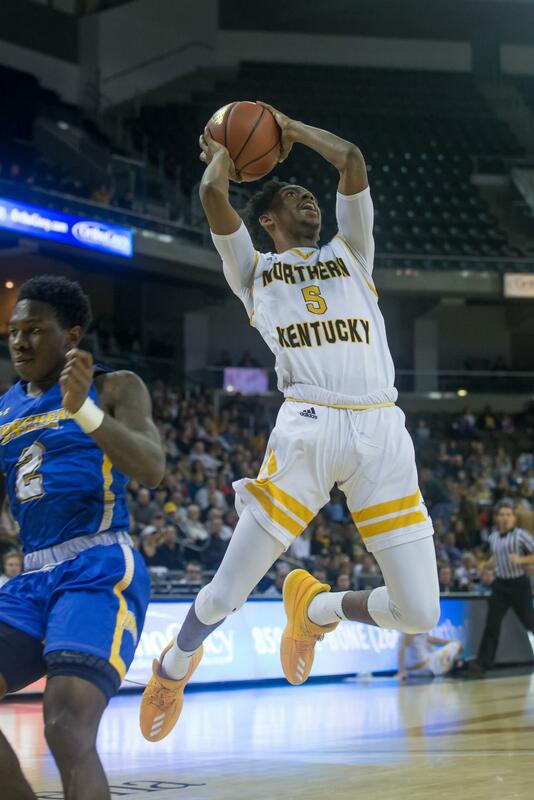 Saturday’s 86-49 victory over Morehead State marked the sixth time this season the NKU men’s basketball team has scored 80 or more points in a game. 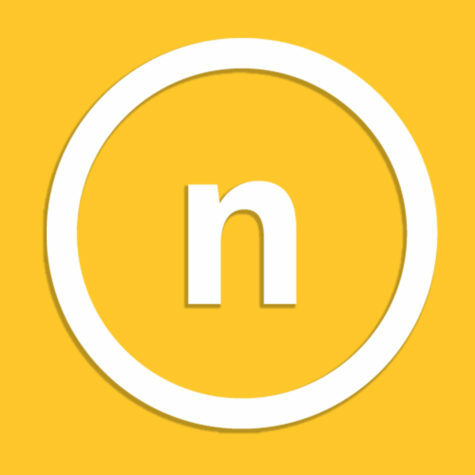 The Norse have only scored below 70 points in a game once this season. Currently, the Norse are averaging 85.3 points per game (ppg) this season, up from 76.5 ppg at this time last season. 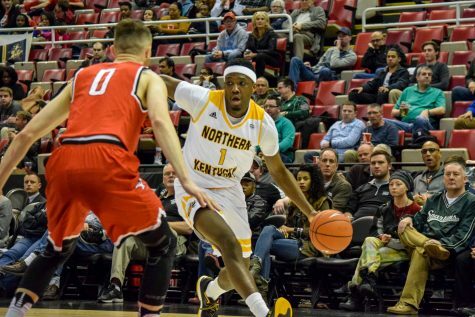 NKU is currently second in the Horizon League in ppg behind only Detroit Mercy, who is averaging 91.1 ppg so far. The Norse offense was on full display in the second half of Saturday’s game, shooting 72 percent in the half and 73 percent from three. McDonald’s 22 points (including his 1,000th career point) in the victory on Saturday makes him one of three Norse averaging double figures in points this season with 15.0 ppg. Lavone Holland is averaging 14.5 ppg while Carson Williams is averaging 13.3 ppg. What is most important to head coach John Brannen, however, is the amount of points the Norse are giving up. The Norse are allowing opponents to score just 62.8 ppg, which is good for second in the Horizon League behind Wright State. On Saturday, they allowed Morehead State to shoot just 28 percent in the second half and only 37 percent for the game. The Eagles only scored 21 points in the second half. Although Saturday’s one-point performance against Morehead State would not support it, Jordan Garnett is an offensive force for the NKU men’s basketball this season. Last season, Garnett showed glimpses of explosiveness, including an emphatic dunk against the Oakland Grizzlies after the Norse forced a turnover. As a junior, though, he averaged just 3.7 points per game. Jordan Garnett (1) drives to the basket during Monday’s Horizon League semifinal win over Youngstown State. So far this season, Garnett is averaging 9.0 ppg (10.1 ppg prior to Saturday) and scored a career high 15 points against James Madison in the Island of the Bahamas Classic on Nov. 17. Since then, he’s logged another 15 point performance against Memphis and a 14 point outing against Berea. “I think he is one of the best small forwards in the Horizon League,” head coach John Brannen said after Saturday’s victory. The 6’ 5”, 220 pound senior forward has been an efficient shooter so far this season, shooting nearly 57 percent from the field this season. Prior to this season, Garnett shot 42 percent for his career. He has been a consistent threat from the three point line this season as well, shooting 44 percent from downtown and already shooting and making more threes than he did all of last season. “If you look back on his statistics from last year and this year, he’s consistently around 50 percent from three, he’s over 50 percent from the field and up until tonight he’s usually an 80 percent free throw shooter,” Brannen said. Garnett was 3-6 from downtown against Memphis, including a three that brought the Norse within one with 25 seconds left. Against Berea, he was 4-6 from downtown. Garnett made his mark initially on this team with his tenacious defense. Brannen relies on Garnett to be a shutdown defender and consistently guards the opposing team’s best scorer. Jalen Tate (5) goes up for a dunk in the game against Morehead. After missing the majority of his freshman season due to a hand injury, Jalen Tate has started every game for the Norse so far this season. Tate’s length is a welcome presence in the Norse lineup that has generated 72 steals so far this season. Tate has a team-high 14 steals and also ranks in the top five in the Horizon League in that category. Brannen has seen his team become more defensively-minded with Tate in the starting lineup. “He takes pressure off Lavone (Holland) from guarding the ball all game. Now he can guard the ball and guard the other team’s best offensive player at times. He cares about defense,” Brannen said. Tate is averaging 7.4 ppg but has shown flashes of serious offensive ability, including his 10-point performance against Morehead State Saturday and a 15-point performance against James Madison earlier in the season.